Bring cream to boil with Earl Grey and cover, infuse for 10 minutes. Mix egg yolks, sugar and rhubarb. Slowly mix the infusion with the egg mix. Bring the mixture on the stove. Cook this sauce until it thickens. Strain and mix with a bar mix and add the softened gelatin. Fill the sphere flexipan and freeze. Note: Cook 200g rhubarb paste, 20g sugar and 20ml water till soft. Blend the mix to form paste. Boil milk, cream, vanilla and the Rose tea. Leave to infuse for 10 minutes. Strain the mixture and add the sugar till dissolved. Mix the softened gelatin. 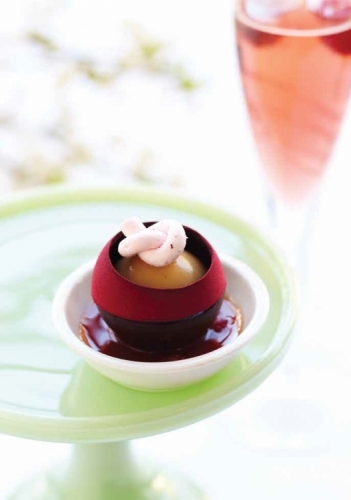 Cool down on ice and pour in chocolate sphere, refrigerate. Make a meringue with egg white and sugar. Then fold dry ingredients. Spread on prepared tray with greaseproof paper and bake at 180°C for 8 minutes. Bring all ingredients to boil and strain. Cook sugar, water, trimoline and purée until 110°C. Combine trimoline and gelatin in mixer, pour the cook mixture in the meringue, add rose water and pipe to any desired shape and set in fridge. Warm up purée and gel, dissolve the gelatin. Boil all ingredients and dissolve gelatin in warm mix and set in containers. Rub in dry ingredients and butter, mix the egg and water to mixture and form dough. Roll to 2-cm thick, cut, brush with milk and bake for 15 minutes at 165°C.